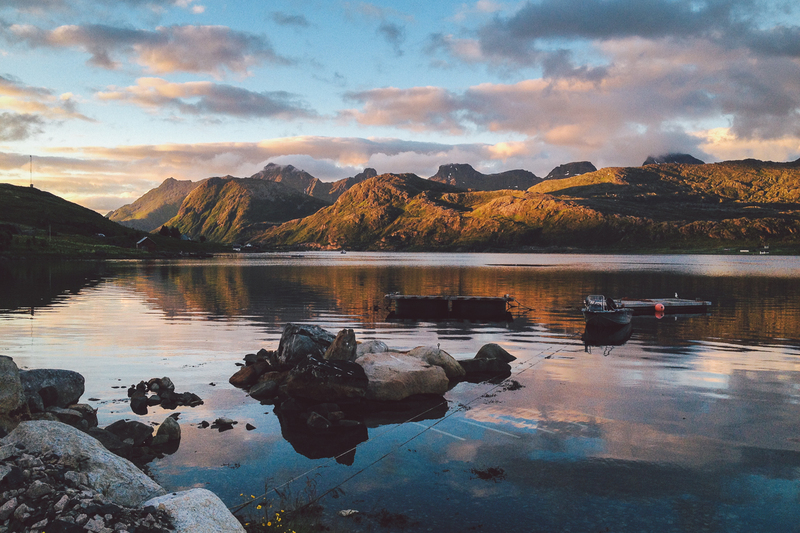 Cod, midnight sun, white sandy beaches – the Lofoten Story vol.3. This is chapter 3. You can read the first one on the first steps here and the second about being in the wild as a solo woman here. 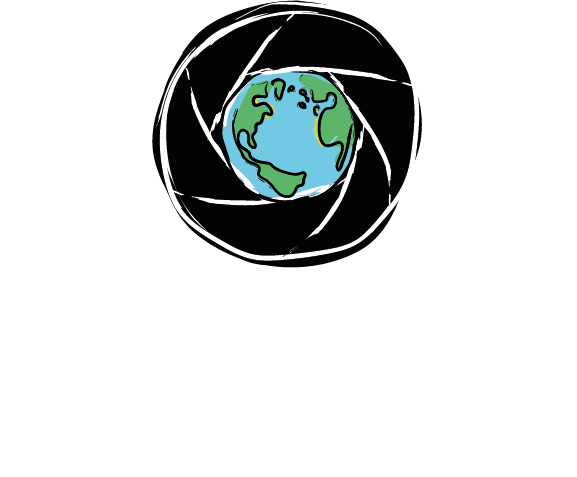 The world beyond the Arctic Circle is quity strange. It’s the land of the extremes. In summer the sun doesn’t sink under the horizon for almost two months, and in winter it’s not willing to get up for the same period of time. 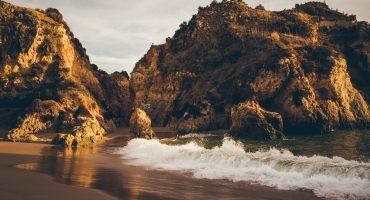 The extremities has of course their effect on those who visit this place, pushing everybody to their limits who is brave enough to go under into the magic of the North. 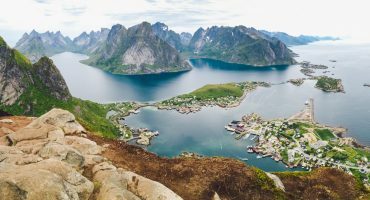 As a man explained grinning in a café in Reine: ‘Lofoten is not at all for just f.cking around.’ He was around seventy. And yes, if we put it this way, between the end of May and mid July it’s just one day: the sunrise is somewhat two months away from the next sunset. Don’t imagine this thing as there is dusk. There isn’t. It’s the same daylight at 2pm as at 2am. 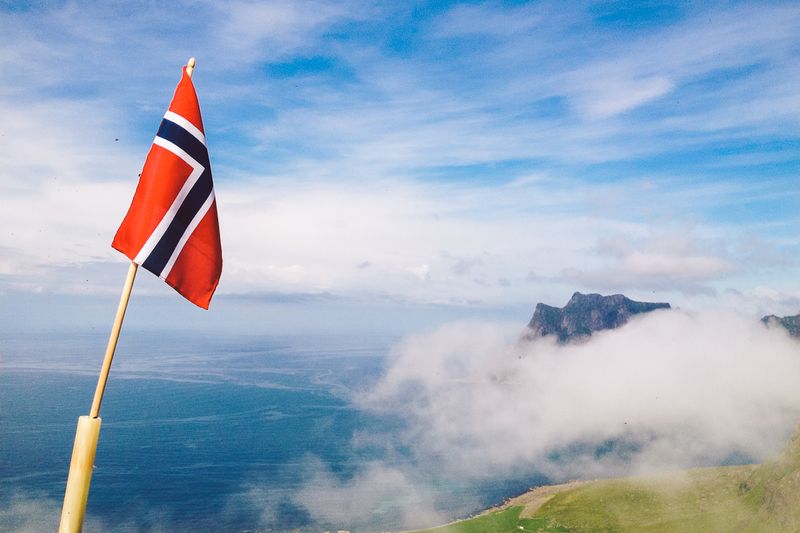 You might be a bit dizzy because of its effect, a lot of people are complaining about sleeping disorders even among the Norwegians who live a bit more to the South, e.g. in Oslo and come up North for summer holiday. I was lucky enough not having any sleeping issues with daylight at night: 1) the tent dimmed the light a bit for me to feel comfortable, 2) I had an eye cover on me which I’d say is a must and 3) I got so tired during the day that I immediately fell asleep at night. Very effective trick. I’ve mentioned before that endless daylight can be quite pleasant, because the otherwise fearful girls are not afraid to travel solo if there is no darkness. So this time I’d emphasis how amazing it can be to go for a midnight hike. I’m lucky enough to have spent a bit of time with the Spanish Laura and her Christian from Greenland (more on them later), and for a couple of days even Laura’s family visited Lofoten. So it was the perfect moment to go hiking together to Hoven (on Gimsøya island) to see the midnight sun from the top of the mountain. Somebody is disturbed by the midnight sun, others might be harassed, as for me, I loved the constant light. Although I needed time to realize that if I wanted to admire the sun at midnight, I shouldn’t look for places open to the West as you would normally do, but to the East. So the best places to watch this phenomenon are at the Northern parts of the islands where you have clear and open view. Only after having returned to Hungary again I realized how much I had missed the mild and dark summer nights with millions of stars in the sky. And the chirping of the crickets. The best is that if you stay there for a while you become used to the cold so much that in 19 degrees you tend to think it’s time for heat alarm. A miniskirt, flip-flop, a duck shaped life saver and you can dart to the sea water. Which is fortunately cool; in case you psych out in the unbearable heat, it almost feels good to sink under the 11,6 degree ocean. Almost. As for me, I had been looking at the water for four weeks before being able to run into it. 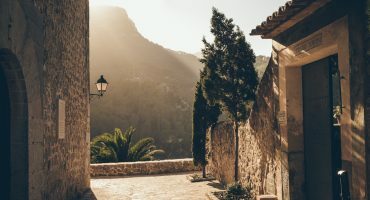 As Anna said who’s been exploring Europe with her husband in a camper: ‘You must have overused the four-letter word.’ I’d say politely instead that only a few could hear my quiet swearing… after the first loud drilling shriek. But white sandy beaches take it all. Along the coast the ocean is so azure you just can’t help watching it for hours. You only sit there and don’t believe. If it wasn’t so cold, you’d remember yourself frequently that you are not in the tropics. 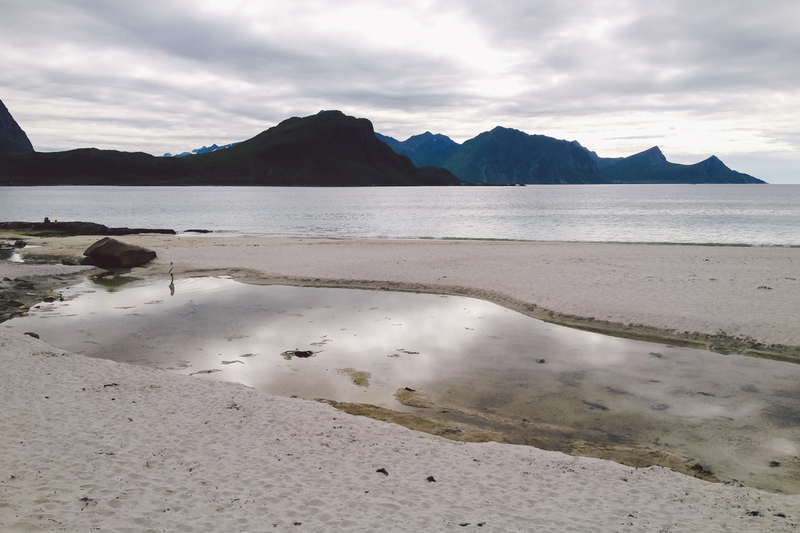 Beaches you shouldn’t miss on Lofoten when your fortune leads you there: Kvalvika on Moskenesøya island (here a river mashes up the white and the dark sand creating nice pieces of artwork), Vik, Utakleiv and Haukland on Vestvågøya (Utakleiv is also ideal for watching the midnight sun, only that you should expect a big crowd there in clear weather) and the small hidden beach of Hov on Gimsøya island. one day I was wandering around looking for nice shells on the beach, but didn’t find anything in particular. 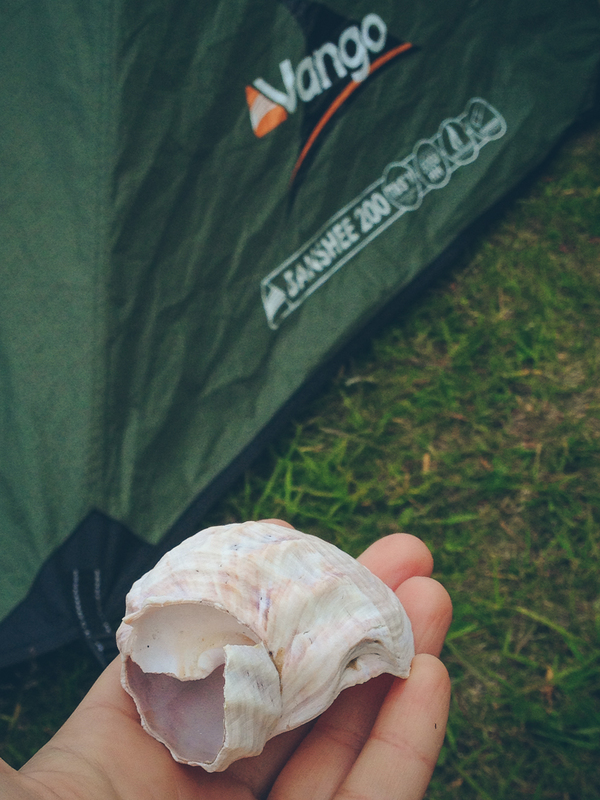 By the time I returned to my place for the night, someone had put a huge and amazing white shell, nicely arranged by the tent. It was way too fabulous to keep, and when later I met Kate the kindest waitress on Earth whose waffle is world champion, I gave it to her as a present. Somehow I knew that it was meant to be hers, I was only the postwoman. It was my dream to sleep in places where I can hear the murmur of the ocean from the bed. Last year in Indonesia I was lucky enough to feel this from a guesthouse. Now in Lofoten, the closest possible to the shore listening to the rhythm of the waves every night from the tent was truly priceless. It was like listening to thousands of relaxing CDs. In fact, on Lofoten there is nothing BUT drama. In the best possible meaning. Rocky mountains erect directly from the ocean, herds of sheep are hanging around the steep hillside (watching you indignantly if they have to take a step further because of you), greens are divided by beautiful lakes with crystal clear water and the blue of the ocean draws your eyes into infinity. 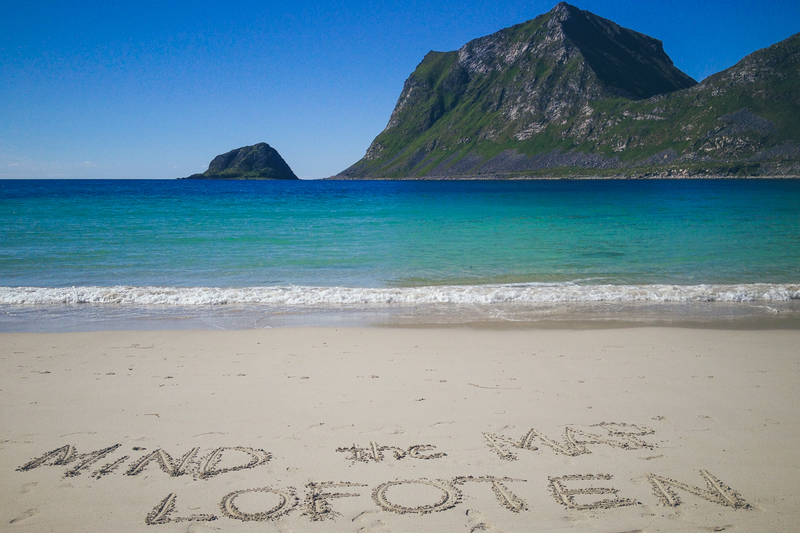 Every island is unique, you can’t say you saw Lofoten if you saw only one of them. 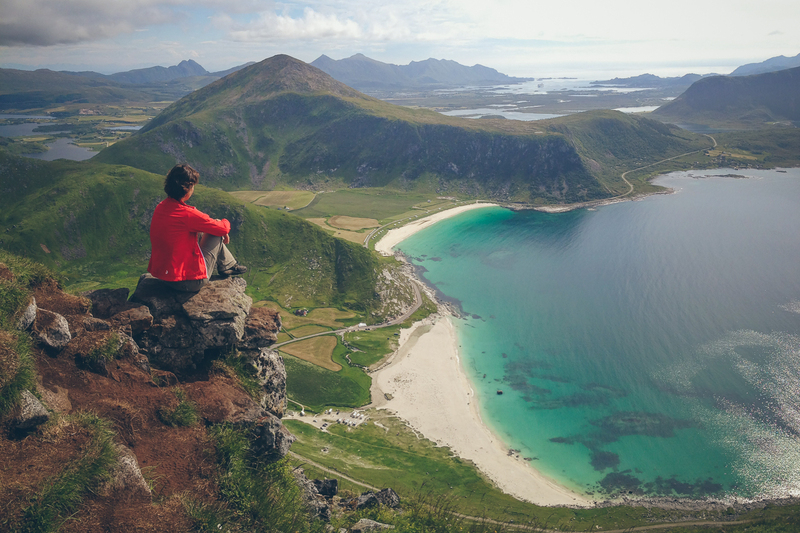 The name Lofoten is originated from old Norwegian language and it means something like lynx foot, because of the shape. Well, to be able to see the lynx foot on the map requires squint or being drunk. But most probably my imagination is not good enough for this. Hands up if you got it! The lakes are not only practical because you can drink from them, but a natural spa hides in them. I had the chance to try a real sauna experience and before this I’ve never been to a sauna so that I could jump into a cold lake after. From 100 degrees to 15 degrees. Check. Feeling alive. And of course, it was raining all the time, but this is part of the Lofoten way of life and on the other hand it doesn’t make any difference when you are under the water. 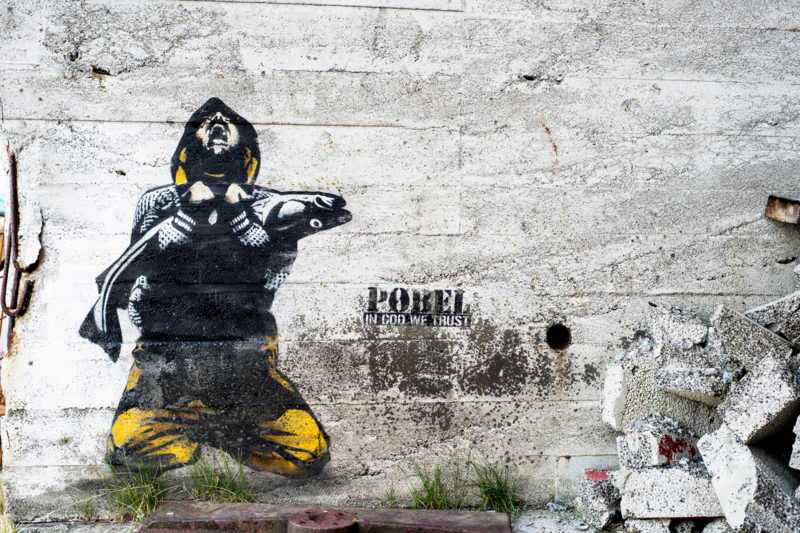 On Lofoten islands codfish has been of huge importance since millennia so no wonder that a street artist transformed the classic ‘In God we trust’ into ‘In cod we trust’ which represents the codfish (skrei) cult better. Drying the codfish is the natural sport there. In February after getting out the guts, the cods are paired by the tail and hanged onto huge wooden structures for drying. This unorthodox Christmas decorations are left there until the end of July. The climate is perfect, not too cold to froze the fish, not too hot to make it rotten, but the constant wind dries them until they have lost 70% of their weight. This is how the fish can be conserved and transported quite easily. Ughhh. And the smell. You can say from a hundred meters that somewhere there are cods drying. Walking in this perfume under the arch of hanging codfish heads is the height of romance. Of course.